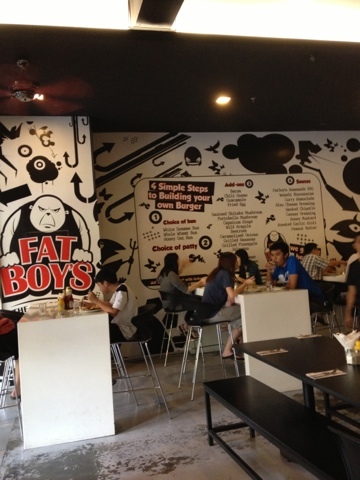 Expatriate in KL: Fat Boys Burger Bar at Publika: Will It Make You Fat? 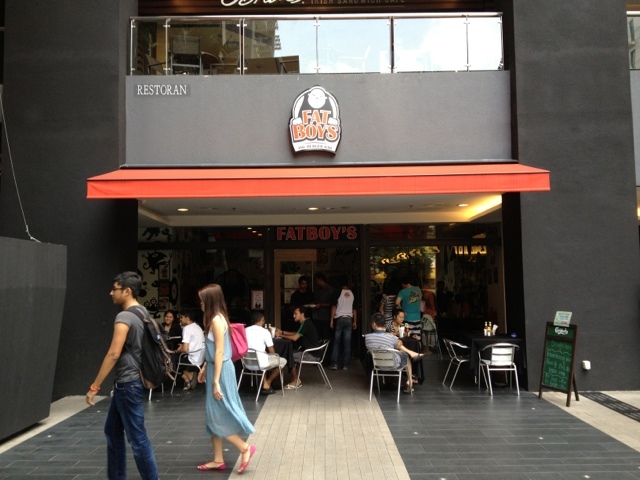 Fat Boys Burger Bar at Publika: Will It Make You Fat? Sunday lunch time, I didn't feel like cooking or eating at home. For some reason, I was craving for some serious burger -- and Wendy's (which is across the street just won't cut it). 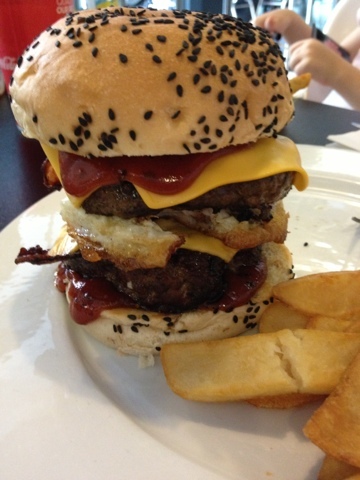 Though I must say for regular burger cravings, it is a good compromise. 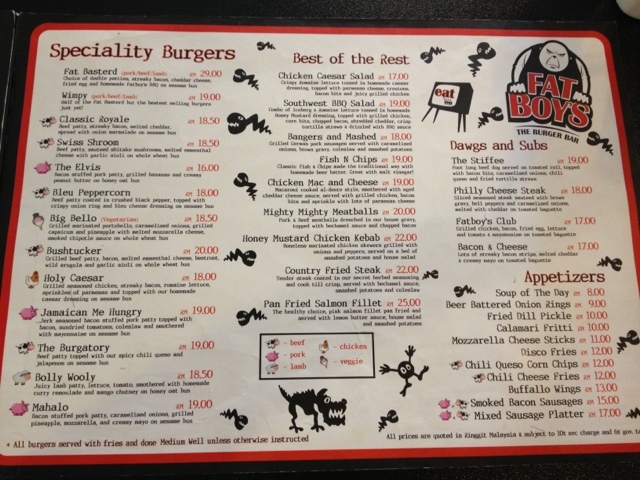 As I waited for hubby to get ready, I had some spare time to search online for other burger places I may not know of, and I landed with several. 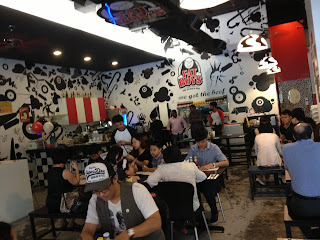 The most prominent and the one that really got me curious is My Burger Lab (Facebook Site HERE). I saw the photos of the queue the store has even before opening time. Too bad they open only at 5pm, else I would have requested hubby to drive us all the way to Petaling Jaya to taste one of its burgers. One distinct thing I saw was that they made their own bread, which was charcoal black, and I wonder how that would taste like together with those juicy beef patties. I will have to hold my curiosity for now, as I cannot imagine driving all the way there, then having to queue up (especially in my current pregnant state). We had to settle for something closer to home, the nearby Publika which is just minutes away. 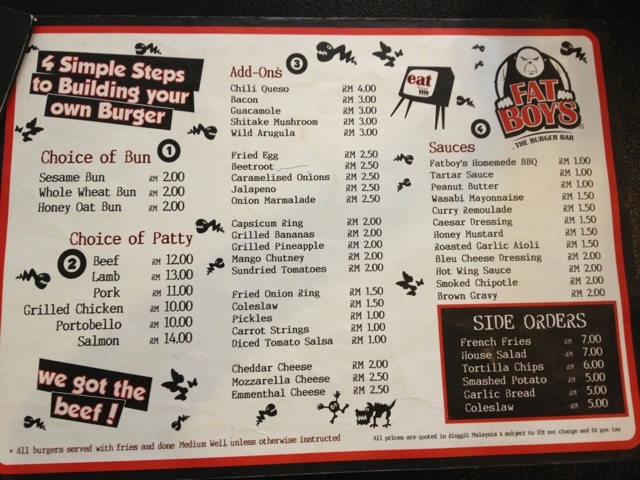 We have been to Fat Boys Burger before, and I believe this is the 3rd visit. 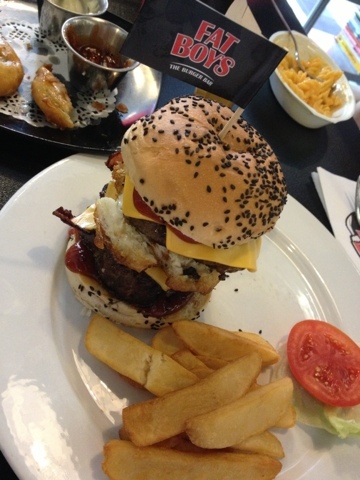 I recall the first 2 rounds were "WOW" for me -- I was amazed with the burgers and milkshake. 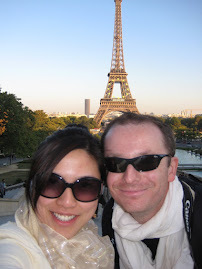 However, I must quickly say that this time around, it was, well, just OKAY for me. Was it my pregnant taste buds? 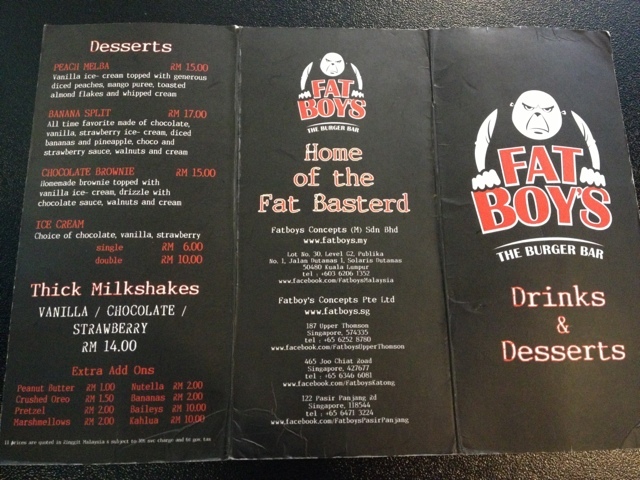 Or perhaps reading all those blog entries about other burger joints? Or maybe they changed their cooking? I don't know really. It was okay -- meaning it wasn't out of this world kind of experience, yet it was not disappointing either. The place was not yet full when we arrived at 12:30noon, we could get seats easily plus they have baby chair, which is good. The waiter was attentive and I would say the service here is quite okay. I decided to be more adventurous than usual and went ahead to order some Beer Battered Onion Rings. I also ordered additional Bleu Cheese sauce with that. The sauce was nice, though that was additional RM2. The onion rings were okay -- a bit on the oily side. Sinful and okay every now and then. It was nice with the Bleu Cheese sauce alternated with the BBQ sauce that came with it. 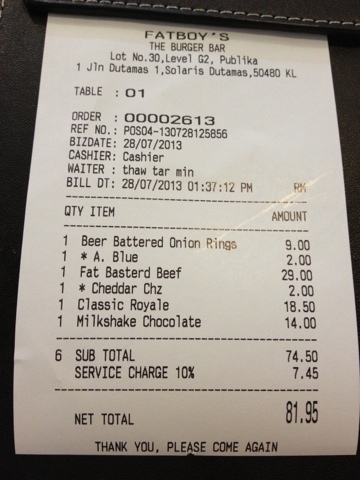 Bleu Cheese sauce - the additional RM2 was worth it, as we used it to dip the onion rings as well as fries. 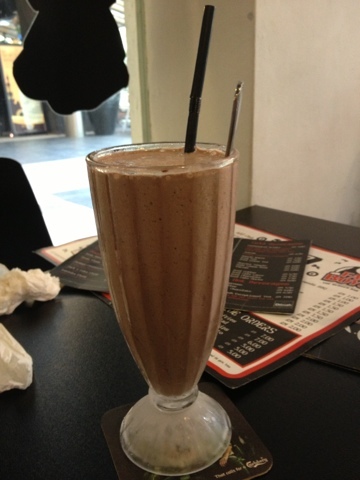 Chocolate Milkshake - this was okay -- I was imagining something better than Ben's, but it turned out to be okay. A bit too thick at the start. I was blown away by their Strawberry Milkshake on my 1st visit, which was probably 9 months ago... however today their milkshake just didn't have that effect. I would go to Ben's for some decent milkshake. 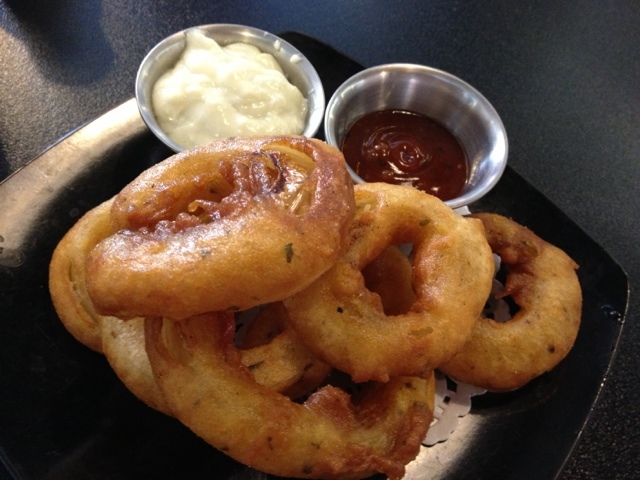 Beer Battered Onion Rings - again, oily and killer. The bleu cheese sauce mixed with BBQ sauce made it really tasty. Though I would recommend this for the non-health conscious folks. Or at least taken once a year perhaps? The burger I had at Plan B last week was equally good. I couldn't remember the price though. 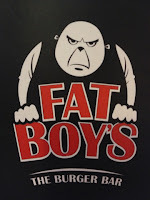 The Plan B fries were less yummy than the wedges at Fat Boys. 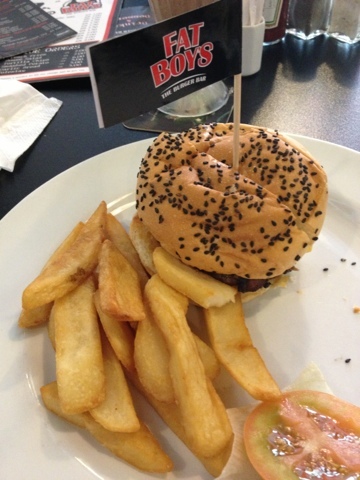 Food quality = 8/10 Burgers were decent, though not out of this world. Price = 8/10 Price is okay, not too pricey, decent pricing. Just wish they gave more sauce though for the price you pay. Had trouble finishing it -- I think this is meant for 2 people to share! Bill for 3 adults. My daughter didn't eat the food there, we brought some food for her.